So here it is just two and half weeks away from Christmas and I’m wearing shorts and flip flops. This current spell of abnormally warm December weather does not do much to inspire me to finish my Christmas shopping or get started on my holiday baking. However, when the calendar says it’s winter I’m breaking out the soup recipes regardless of the fact that it is nearly 80 degrees outside. This recipe comes from one of my favorite community cooking sites, Allrecipes. Most everything I have made from the website has turned out delicious, especially if you stick to the more highly rated recipes. Of course, I couldn’t leave it alone and follow the recipe exactly. I added a few more vegetables and spices and came out with a winner. I love recipes like this where a few changes can make it authentically your own. Feel free to use what ever veggies you have on hand and which ever type of Italian sausage your family prefers. Heat a stockpot or Dutch oven (6-to8-quart) over medium heat. Add the sausage and cook while crumbling until no longer pink. Remove the sausage from the pot and drain any excess fat. Add the sausage back into the pot and all the rest of the ingredients, except for the zucchini and spinach. Bring to a boil over medium-high heat. Cover, reduce heat to low and simmer for 30 minutes. Add the zucchini and simmer for an additional 5 to 10 minutes until the zucchini is cooked through but hasn’t turned to mush. Add the spinach and stir. When the spinach has wilted the soup is ready to eat. Garnish with Parmesean cheese and/or fresh chopped Italian parsley (and a shake or two of crushed red pepper if you want it a little spicy). 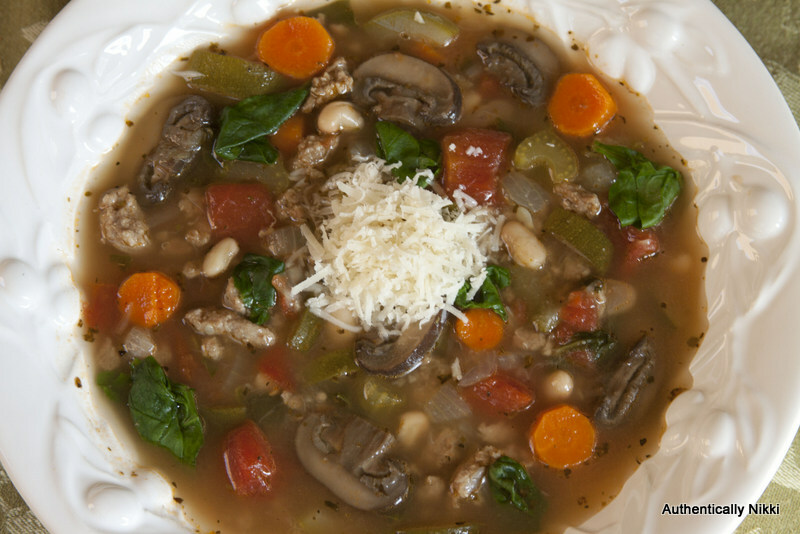 This entry was posted in Soups, Stews and Chilis and tagged Italian sausage, soup by authenticallynikki. Bookmark the permalink.